Nebraska held No. 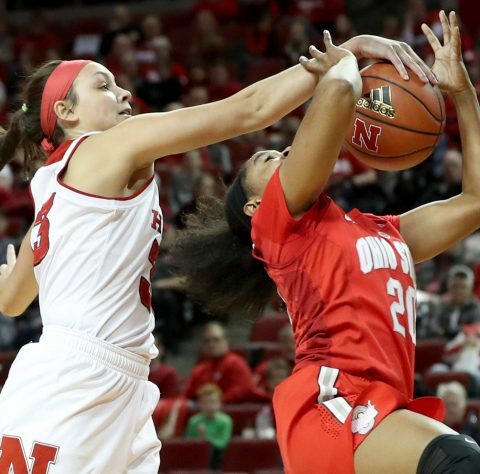 12 Ohio State to its second-lowest point total of the season, but the Huskers could not muster enough offense to knock off the defending Big Ten champion Buckeyes in a 73-61 loss at Pinnacle Bank Arena on Thursday. The Huskers slipped to 9-5 on the season and 0-1 in the Big Ten, while Ohio State improved to 12-2 and 1-0 in the conference. All-American Kelsey Mitchell led the Buckeyes with 25 points, one under her season average, while Linnae Harper added 14 points, including a pair of big buckets midway through the fourth quarter. Sierra Calhoun was the only other Buckeye in double figures with 13 points, as Nebraska held the nation’s highest scoring offense nearly 19 points under its season average. Prior to the game, only No. 14 Duke, who held OSU to 60, had kept the Buckeyes from scoring at least 83 points in a game. Nebraska got 14 points, six rebounds and a career-high-matching four assists from junior forward Maddie Simon, while freshman center Kate Cain contributed 14 points, eight rebounds and a pair of blocks. Those two Huskers combined to hit 12-of-21 shots from the field, including 2-of-4 threes by Simon. Unfortunately, the rest of the Huskers combined to go just 12-for-35. Sophomore point guard Hannah Whitish gave the Huskers three players in double figures with 12 points, five rebounds and four assists on 3-of-8 shooting from the field. Freshman guard Taylor Kissinger also made a significant contribution with eight points in her return after missing the past six games with a knee injury. Kissinger, who entered the game as Nebraska’s leading scorer after scoring 14.0 points per game through her first seven contests as a starter, played 15 minutes off the bench. Her three-pointer with three minutes left in the game cut Ohio State’s lead to eight points at 67-59. Whitish got a pair of free throws with 1:21 left to keep the margin at eight points, but a bucket by Mitchell with a minute left pushed the Buckeye lead back to double digits in the final minute. Nebraska kept the Buckeyes within striking distance despite falling behind by 18 points late in the third quarter. The Buckeyes kept that 18-point margin early in the fourth at 60-42, before the Big Red battled back. Senior guard Emily Wood sparked the rally with a three-pointer, before Jasmine Cincore and Whitish hit back-to-back shots to trim the OSU margin to 60-49 with 7:18 left and force the second timeout in 1:05 by Ohio State. Harper then made two big plays to quickly push the margin back to 15 points, before Cain, Simon and Whitish fueled a 7-0 Husker run in 1:15 to cut the margin to 64-56 with 5:00 left in the game. As a team, Nebraska hit 41.1 percent (23-56) of its shots, including 51.9 percent (14-27) in the second half. The Huskers were 4-for-9 from three-point range in the second half after going just 2-for-12 from long range in the first 20 minutes. Nebraska hit 9-of-14 free throws for the game, including 5-of-6 in the second half. Nebraska outrebounded Ohio State, 39-36, but lost the turnover battle, 23-15. The Buckeyes hit 42.9 percent (27-63) of their shots, including 34.8 percent (8-23) of their three-pointers, and connected on 11-of-14 free throws (.786). Ohio State used a 14-1 surge early in the first quarter to jump out to a 17-5 lead after Nebraska led 4-3 in the opening moments. But the Huskers turned down the tempo and held the high-scoring Buckeyes to just two field goals in the final 4:50 of the quarter, outscoring OSU 10-5 to trim the margin to 22-15 at the end of the quarter. The Huskers scored on their opening possession of the second quarter to cut the Buckeye lead to 22-17, but then went more than four minutes without scoring. However, the Big Red continued to defend and trailed just 27-21 after an Eliely layup with 4:54 left in the half. Mitchell, who had 13 first-half points, scored OSU’s final four points of the half to give the Buckeyes a 34-24 halftime lead. The 34 points tied for the third-fewest points scored in an opening half this season by Ohio State. As a team, the Huskers hit just 31 percent (9-29) of their first-half shots, including 16.7 percent (2-12) from three-point range. Nebraska went 4-of-8 at the free throw line and was outrebounded, 22-21, in the half. Cain led the Huskers with seven points and five rebounds, while Kissinger added five points off the bench. The Big Red held Ohio State to just 36.7 percent (11-30) shooting, including 4-of-12 threes (.333). The Buckeyes went 8-of-10 at the line and won the first-half turnover battle, 11-8. Harper had eight points and six boards for the Buckeyes to support Mitchell’s 13 points. The Huskers open a three-game Big Ten road swing by traveling to Minneapolis to take on Minnesota New Year’s Eve. Tip-off between the Big Red and the Golden Gophers is set for 2 p.m.with a live video stream on BTN Plus.